Enjoy string quartet music, candlelight tours, wine, cheese, and more at the Smith-Appleby House’s presentation of “Music at the Museum” on Saturday, Nov. 19. The Col ‘Areo Quartet will highlight the night, performing traditional string quartet music and featuring the museum’s newly restored 1897 chapel organ. Attendees will tour the museum by candlelight, and enjoy wine, cheese, and hors d’oeuvres — along with special soup shooters served at the hearth. Volunteers from the Historical Society of Smithfield, dressed as and portraying Colonial-era characters, will host the evening. 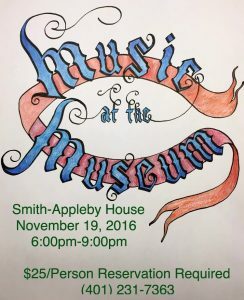 “Music at the Museum” will be presented Saturday, Nov. 19, from 6 p.m. to 9 p.m. The cost for the evening is $25 per person. Reservations are required as space is limited. Call (401) 231-7363, and leave a message. You will be contacted to confirm the details of your reservation. Payment in advance is encouraged. The Smith-Appleby House is located at 220 Stillwater Road in Smithfield, RI, just off I-295. The House is owned and operated by the Historical Society of Smithfield, RI, as a living museum hosting a variety of educational activities, programs, and events throughout the year. Group tours are available for schools, scouts, and other community organizations. The House and property, listed on the National Register of Historic Places, are also available to rent for private events. For more information, visit the website athttps://www.smithapplebyhouse.org or contact us by email atcontact@smithapplebyhouse.org or by phone at 401-231-7363. Follow the Smith-Appleby House on Facebook at http://facebook.com/SmithApplebyHouseand on Twitter at http://twitter.com/SmithAppleby.